The “pushers” or “penny falls” (or whatever you like to call them) have always been popular in arcades. I never saw the attraction for years (I always played the video games until I discovered the fruit machines), seeing the massive overhang of coins didn’t do anything for me. Until one year I went to stay at Pwllheli, North Wales. Simply put as nicely as possible, it wasn’t exactly the sort of place to find the kind of arcade I liked. Sure, there were a couple of pool tables, which kept me and my dad entertained for a little while, and there were some arcade games like Sunset Riders and… erm… I can’t remember there being any others, really. And that really was it. The fruit machines didn’t appeal to me (too many Bellfruit machines, if I remember rightly), so I was kind of forced to look at the other amusement machines. I changed a pound down, and spent ages on them. I don’t know why I enjoyed it so much, maybe it was the tension of getting down to the last ten pennies, then getting a colossal drop of coins out, and moving on to the next overhang. 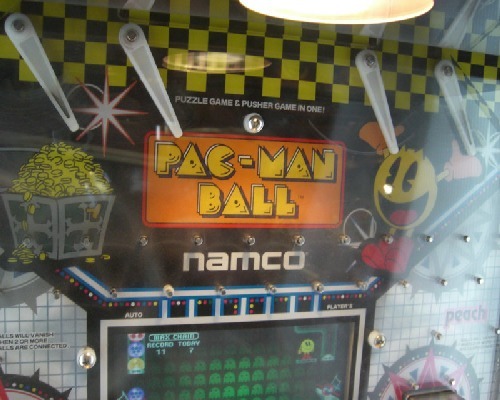 Fast Forward almost a decade, and on holiday in Newquay this time, and me and the better half discover Pac Man Ball. The basic mechanic of winning is the same, put your coins in, watch them drop down onto the pusher area, and hope for a big drop of coins. However, there is the added bonus of the screen in the middle of the play area, and the bonus boxes you can hit with your coins to activate the screen. Which is basically a game similar to Puzzle Bobble. On one side is a fruit waiting to launch, on the other is a launch pad for whatever fruit your coins may have activated on the way down. If you manage to launch the same as the fruit on screen, they collide, disappear and a couple of extra coins fire down onto the moving platform to increase your chances of a win. If they don’t match, the two symbols will bounce off each other and drop towards the floor, where again any matching symbols will be taken away, and this is where the chance for big money lies. If you’re lucky, you could wipe out a number of fruits that cause further matches to be made as they cascade downwards. 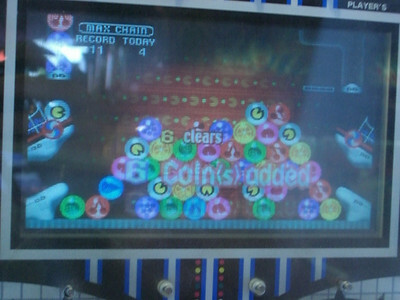 Through this you could accumulate up to 50 coins, all of which will slide down onto the moving platform. Don’t expect to win all these coins, however this is your best chance to get a few at the very least! A lot will drop down into the machine’s coffers, though. 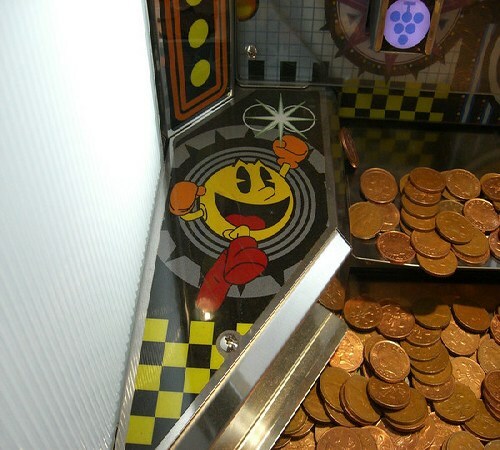 Alternatively, if you manage to link up two Pacman symbols, you’ll get a “Wheel of Fortune”, where again you could add up to 50 coins to the sliding tray. If the arcade operator isn’t feeling quite so greedy you may find, sitting atop the massed coins, actual paper money, usually fivers. These make a nice welcome addition to your pocket, however more often than not, you’ll have a cycled a fiver or more through the machine to get it. 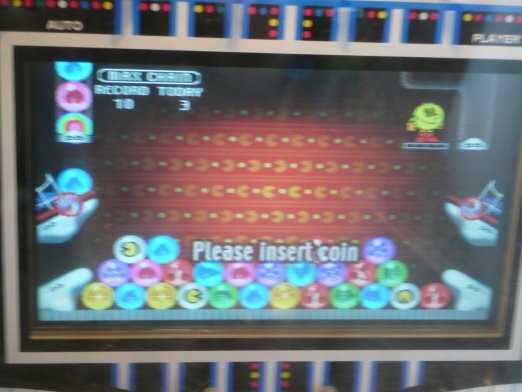 The other thing to remember is that the screen part is PROBABLY NOT random at all, in terms of the symbols presented, the bonuses awarded, and also how far the fruits bounce apart when they collide. When the pile gets big enough, new balls that land are removed if they're too high, and I have seen it get as fruits land repeatedly atop two peaks (and therefore disappear) until you eventually get a match. But it's rare to get to that stage. With the 50 coin drop limit, your combos could potentially be pretty big (and a record is kept on screen of the best and longest combos), practically clearing the screen, but still with only 50 coins dropping (which to be honest only takes a 3-4 combo to achieve). You know what, if you get to see one of these machines, give it a go. I've seen it in two flavours previously, 10p drops and 2p drops. 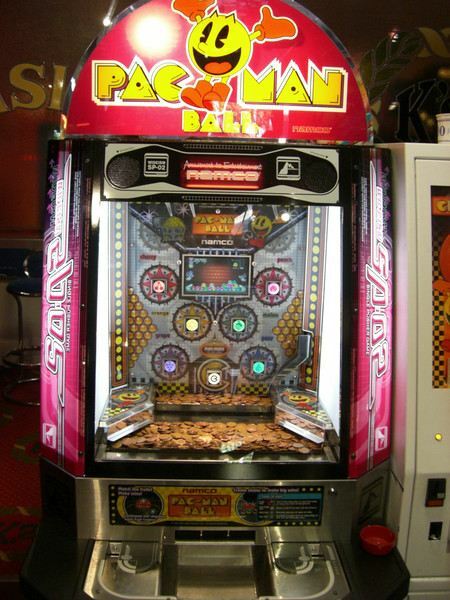 Changing a couple of quid down to 2ps could potentially earn you a good 2 hours or more play, we certainly managed to get nearly 3 hours of play out of £4 in 10p's in Cornwall about 7 years ago. Great post Fishta! My wife loves penny falls, I love video games - we need to find one of these machines! If I won the lottery? Star Wars cabinet, Bubble Bobble, Super Sprint (3 wheel), Warlords, Teenage Mutant Ninja Turtles (4-player), WEC Le Mans, Robotron and Ferrari F355 Challenge for starters!